Christmas is a time many of us give gifts from the heart. This tradition has its roots in the legend of the Three Wise Men who came to pay homage to the Christ child. Exchanging gifts was, and still is, a very important ritual in the Middle East. Each of the three gifts given by the Magi, were thought to be precious and highly valued. 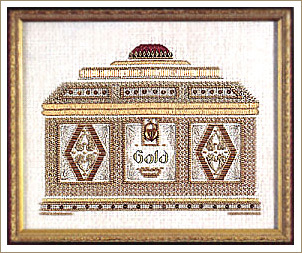 This sampler symbolizes the gift of Gold. According to the legend, Gold was given by Melchior, the King of Arabia. Gold was a gift traditionally given to kings, and thus signifies the acceptance of the Child Jesus as King of the Jews. This sampler is shaped like a casket or treasure chest, giving an impression of the type of container such a fine gift would be carried in. In keeping with its contents, the opulent gold stitching, couching and beadwork shimmer with rich beautiful lights! Where possible, I have used the similar fabric and fibers used in Frankincense. I hope you stitch this with thoughts of love, joy and true generosity of spirit! Design Area: 82h X 104 Model: 28ct. Platinum Cashel Linen 5.75" x 7.25" design size.